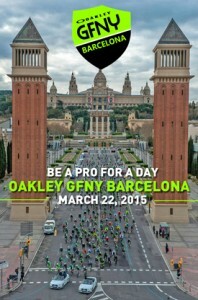 Oakley GFNY Barcelona on March 22, 2015 was the first ever mass-participation cycling event in Barcelona, Spain. A sold-out field of 1000 riders from 27 countries tackled the challenging course that started and finished in the heart of the city at the famous Montjuic. Riders enjoyed completely closed roads through Barcelona, on the main highway out of town and along the spectacular coastal road past Garraf. The GFNY Barcelona course is similar to the pro race Vuelta Catalunya’s 2015 Stage 7. Local and regional police forces were out in droves on motorbikes and in cars to close roads in a similar fashion for Oakley GFNY Barcelona’s participants, ensuring a safe event and providing the right of way for all riders along the whole route. Athletes were able to choose between a 111-mile / 178km long route with 9,500ft / 2,900m of climbing and a medium route of 70mi / 115km with 6,500ft / 2,000m of climbing. The first 10% in each age category qualified for a racer corral start at the inaugural GFNY Championship on May 17, 2015 in NYC. Barcelona is the world’s second-most photographed city (after NYC), which demonstrates its touristic value. Mild temperatures in March and ideal riding conditions in the area make it the perfect place for cyclists to come for a spring training camp culminating in Oakley GFNY Barcelona. Organizers expect to double the participant field for the 2016 edition and aim to reach 5000 riders within five years. The last stop of the GFNY World tour before the Championship in NYC on May 17, 2015 will be CRM GFNY Colombia held in Bogota on April 26, 2015. 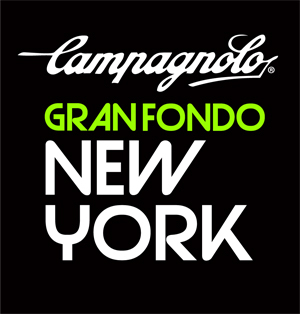 It will be world’s highest granfondo, reaching an altitude of 11,000ft / 3,356m. The recent resurgence of professional racers from Colombia has further sparked the country’s enthusiasm for cycling. CRM GFNY Colombia promises to be yet another exciting GFNY World event. A rider’s view of the race can be found in his clip here. The official event video and pictures will be available shortly.